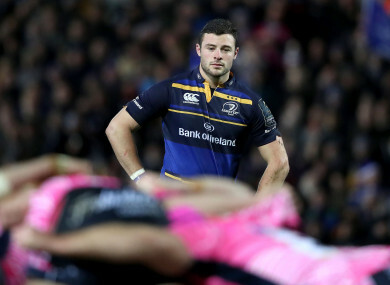 Robbie Henshaw has never been one to shy away from the less glamorous side of the game. ROBBIE HENSHAW WON’T shirk a repeat of the trench warfare that was needed to take a win away to English Champions Exeter when the Chiefs arrive for tomorrow’s return fixture. He reckons the ‘down and dirty’ close combat approach is in his blood. The Athlone man has made himself into something of a midfield enforcer since moving from early runs as fullback to an inside centre berth with Ireland and now Leinster. And the physical traits of an imposing 6′ 3″ 102 kilo powerhouse were put to use as in Exeter as he effectively became an extra flanker for Sunday night. There’s plenty of back around who would wince at the need for such double-jobbing. Not this one. “Well, we got the win, didn’t we? I got stuck into the mix of it myself a few times. I was getting a bit cold in the outer channels so I rolled up my sleeves and helped the forwards a bit,” says the centre. This Leinster team don’t get caught up on devotion to expansive attacking rugby. Senior coach Stuart Lancaster often reminds listeners that there is no right way to win a rugby game and the victory over the Chiefs was a prime example of how the eastern province are willing to out-work even a club renowned as one of the hardest-workers in Europe. Henshaw personally, put that lust for a grapple or the less glamorous work of supplying himself for clear-outs down to the tight five pedigree passed down to him by his father Tony and uncle Dave. “My old man and uncle were prop forwards so there must be a bit of a gene inside me which doesn’t mind the down and dirty stuff. A performance like Sunday’s must pull Henshaw’s tight five family members that bit closer. “Yeah I suppose it reminds them they weren’t fancy or flash players with fancy passes or step-offs each foot. They were just kind of pick it up, head down and drive. Email “'There must be a bit of a gene inside me which doesn't mind the down and dirty stuff'”. Feedback on “'There must be a bit of a gene inside me which doesn't mind the down and dirty stuff'”.